We have just a few super cute CAPTIVE BRED baby egyptian tortoise for sale (also known as Kleinmann’s tortoise for sale). These little egypitan tortoises are eating a variety of calcium dusted greens, mazuri tortoise chow, opuntia cactus and are doing fantastic. 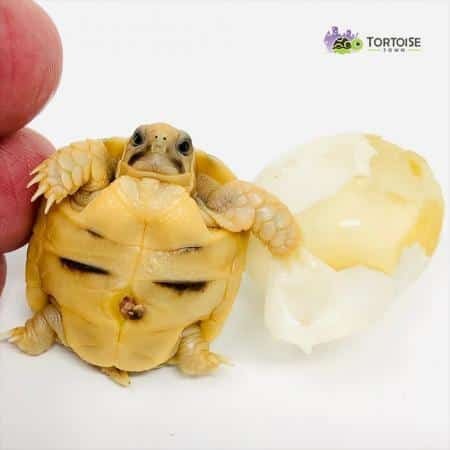 Though we offer baby egyptian tortoises for sale, we always recommend the 6 month old well started egyptian tortoises for sale over the more fragile egyptian tortoise hatchlings. The smallest and rarest of the testudo tortoise family, Egyptian tortoise are fairly easy to care for when compared to most other species of tortoise for sale. When choosing any tortoise it is important that you purchase a healthy animal from an experienced tortoise breeder. Captive bred Egyptian Tortoise babies for sale should always be purchased over a wild caught adults when possible. Our Egyptian Tortoises for sale are top notch and ready to ship to you via FedEx Overnight in heated or cooled, insulated shipping boxes and come with our live arrival and full 7 day health guarantee. One shipping charge covers up to 4 tortoises.